Why do whale and dolphin tails go up and down? Home > About whales & dolphins > Why do whale and dolphin tails go up and down? Unlike fish, whales and dolphins evolved from four-legged animals with limbs underneath their bodies, their backbones naturally bend up and down and not side to side. It is also why their tail fins are horizontal and not vertical like those of fish. The tail fin, or fluke, is used for propulsion through the water. Although they no longer have hind limbs, whales and dolphins still have vestigial pelvis bones. In some species these are used to help support reproductive organs. 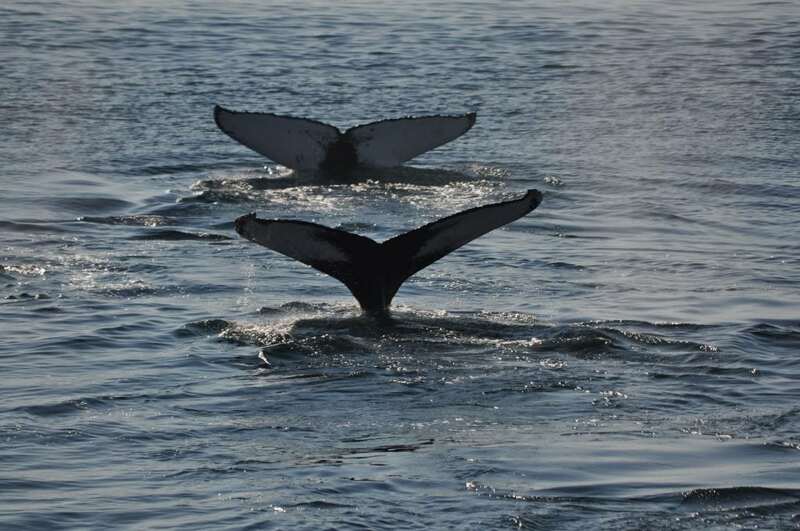 The tails of some whales, such as humpbacks, have distinctive markings which enables scientists to individually identify each whale. Other uses for the tail include occasionally slapping them on the surface of the water as a form of communication or to stun prey at the surface or underwater. Another unusual activity employed by species such as southern right whales, is "tail sailing" where a whale will lift the tail vertically out of the water for long periods of time. The pectoral fins (on each side) provide directional control and the dorsal fin (in those species that have one) provides stability whilst swimming. Many individuals however have been documented without a “complete set” of fins (likely as a result of incidental entanglement in fishing gear, being hit by a boat’s propeller or a lucky escape from a predator) and therefore they can sometimes adapt quite well to losing part or all of a fin.